Being an integral part of your family is the desire of all Unique Dobermans! This is the single most important thing he has been bred to do! Your Unique Doberman needs to be an integral part of your family network to fulfill his strong need and desire to protect you, your family and your home. Early socialization is critical for your Doberman puppy to learn what is normal human behaviour and when it isn't normal. ​Your Unique Doberman puppy has superior genetics and intelligence and if he is raised properly with your toddler then he will respect his place in the family unit. ​If you have trouble keeping your toddler and kids from biting, kicking or hitting each other and even YOU, then I would suggest that you do not purchase a puppy until you can teach your child some manners first. ​Common sense tells you the intelligent Doberman puppy will bite back in self defense if he needs to! Are Unique Dobermans easy to housebreak? Yes! Dobermans are one of the top 5 Smartest Dogs in the World. However, I will blunt here... if you can't housebreak your kid and it's still in diapers soiling himself at 3 years of age when they are able to talk, then I highly doubt you can housebreak a Doberman puppy that can't talk, if this is the case then Please wait on this Unique Doberman purchase until your children are potty trained and have been properly taught how to treat a dog, or it would probably actually be best to maybe wait until your children are grown and out of the house before you consider purchasing a Doberman. Dobermans just like children need to be raised in a safe and secure home, if your home is currently chaotic please consider holding off on a puppy purchase until your schedule slows down enough to accommodate the demanding needs of a growing Doberman puppy. A Unique Doberman is one of the smartest breeds of dog there is, if your toddler is constantly outsmarting you then I guarantee your Doberman puppy will also! 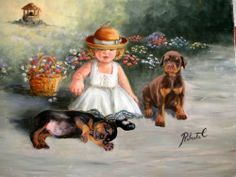 A home with children and a Doberman puppy must have some discipline and order to be successful. ​While we have many Unique Doberman puppies successfully in homes with infants, small toddlers, children of all sizes and shapes, our Doberman puppies for sale are not for everyone or suitable for every family. Please give this some very serious thought and reflection before you make a Unique Doberman purchase. I heard European Dobermans are VICIOUS!?! This is certainly NOT true! In this photo is a German import IPO 111 and VPG 111 Titled Schutzhund Dog watching tv with a 4 yr old visiting grandson. Most properly raised and trained European and German Dobermans have an incredibly sound temperament, they are not easily provoked, they are not shy, they are not sharp. This is because they are not afraid of anything or anybody. They are confident and courageous enough that they just are not afraid, this is why there are not many fear biters in German or European Dobermans. This fear mongering statement has been a common theme from some of the uneducated American Doberman breeders who see flocks of their puppy buyers leaving in droves to purchase a calmer, larger boned European Doberman instead of their nervous, high strung, fine legged and delicate "Show" dog rejects. I've talked to the buyers who are scared and heartbroken as they watch the puppy they invested so much money, time and love in begin having serious health issues which end up costing them a fortune in health bills, and loss of life prematurely. They are tired of the nervous and "Clingy" temperament they are seeing and experiencing. 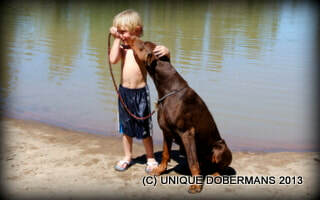 The American Doberman show breeders call this a "Velcro" dog, I call it something entirely different! Some of these American Doberman issues involve excessive chewing, eating items like socks and underwear which require expensive surgeries to save their lives, cowering, shaking and trembling when taken out in public. I've personally seen "Show Dobermans" at AKC sanctioned events shaking in their crates, having diarrhea, vomiting, shying away from the judge in such a fashion that it looks like it's bowing etc. this is not a stable dog! A Doberman or any dog that displays this type of temperament issues should NOT be bred solely on what ribbon in a show ring it might win for it's owner to hang on the wall! ​"If man is not to stifle his human feelings, he must practise kindness towards animals, for he who is cruel to animals becomes hard also in his dealings with men. Dobermans are very efficient at sensing a threat, they can run faster and for longer distances than any bad guy! Your Unique Doberman has been hand selected from strong imported European IPO/ Schutzhund genetics and they will hear and smell any human threat long before you do, he will still be on duty while you are sleeping and even while you are away from home. He provides a secure 24 hour around the clock surveillance that no camera can match! A dog- A Unique Doberman Dog is an important part of your overall personal security system, perhaps even the most important part but they are not a complete system. Crime is going to happen, we cannot stop that, mankind has tried to stop violence since Cain and Able and not been successful yet, Owning dogs deters crimes, owning Dobermans deters even more crime, and owning a Doberman that is trained to bark and give an aggressive alert or BITE on command is nearly always enough. I don't ever intend to use my dogs to "catch bad guys" that is what law enforcement is for, my Dobermans are only to deter the bad guy long enough to buy me time to get to safety and secure my weapon, they deter crime, and they buy me time if I am in trouble. That is it. Our Dobermans are taught a long attack so it can meet the confrontation while we get to safety. What we are doing with our personal security plan, is really making someone else the victim. I know that sounds harsh but crime will happen, and we don't want it to happen to us or our loved ones. So the things below are things we want all of you to do to stay a little bit safer. Bad guy philosophy- Interviews and research show that bad guys are not afraid of getting hurt, it isn't the dog bite that scares them the most. What they fear the most is "getting caught". Barking dogs draw attention to a situation and increase the chance that they will be "caught". That is why even little fufu dogs help deter some crime. Another great thing is bad guys seem to be inherently afraid of dogs, "Big Dobermans" especially. Thank you Hollywood for helping to create this phenomenon! So we want to increase the chances someone thinks they would get caught hurting you or your property and they will move on to an easier victim instead. Electronic security system- You need a home electronic security system with at the minimum door and window sensors. It needs to be installed and working, there needs to be signs in the front yard and on windows. We have a great resource for electronic home security, email or call us to find out more. Your dog- Must be allowed to bark anytime someone comes to the door. Encourage it, reward it. They need an "off" command to stop barking, but never discourage your dog from letting you know when someone is there. Warning barks are frustrating when you live with them every day, especially when you have 3 barking Dobermans :) but that is what makes my house a harder target for crime. If you have a dog, take him with you every where you can! What good is the protection dog that is locked up at home while you are at the park? This is another reason I tell people to get multiple dogs, so one can be at home protecting the house while one is protecting you. I also often show a demonstration where with a really good dog, I can fight off about anybody and keep myself safe for the most part. Two dogs change the fight dramatically, and are absolutely impossible to deal with. The other neat thing is to watch the pack dynamic develop and watch how they really work together and use team work.